Today I am going to give you a tour of my kitchen remodel, but first since you are visiting my home I must offer you a cold beverage. I hope you are okay with that. Summer shandy seems to have grown increasingly popular over the years. The basic shandy formula is beer + lemonade. Now I know you can buy pre-made shandies at the store I have a few in the beer fridge in the garage right now. When the sun is hot and it is a bajillion degrees out a shandy is incredibly refreshing. 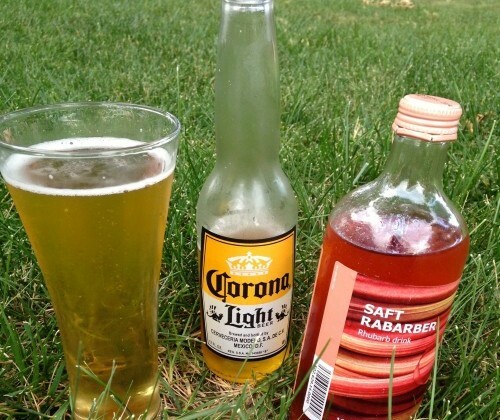 This summer shandy has Saft Rabarber in it. What on Earth is Saft Rabarber you ask. Well that is just Ikea for rhubarb syrup. You could always make your own rhubarb simple syrupÂ though. 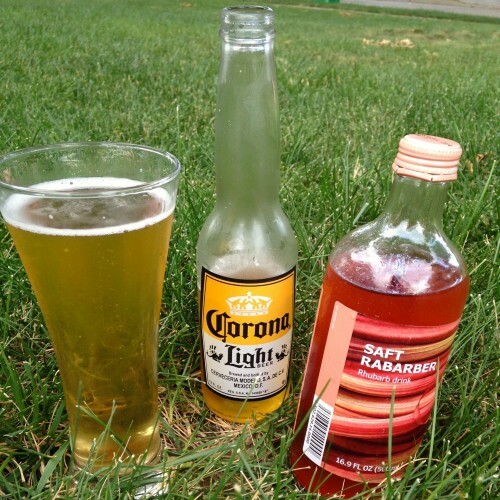 Grab a glass and your favorite light beer and we will mix up a shandy. May 4, 2014 my husband tore the wall down while my wonderful sister came over and helped me paint. On May 7 the construction started to get real! 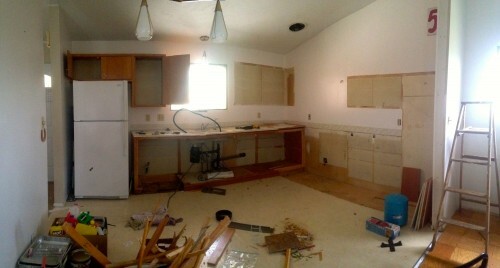 Here is one last shot of my old kitchen intact. My little man had to help in the renovation. He did not hesitate to swing the rubber mallet. 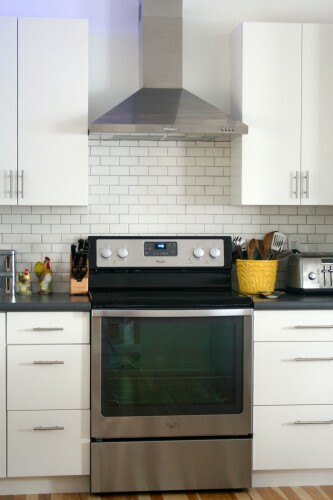 When I was making one of a thousand trips to Home Depot my husband had ripped out the cupboards on the south wall which included my faulty tiny oven. I was thrilled when I saw that hunk of junk on the driveway. 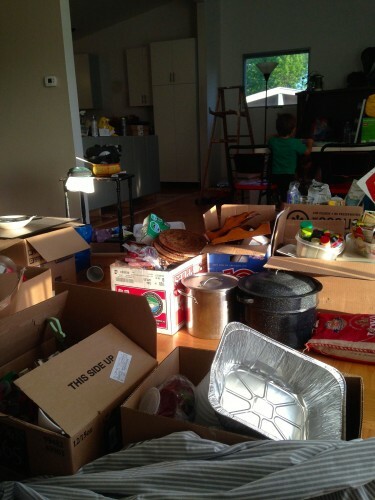 Since I was 37 weeks pregnant at the time I was not allowed to tear out the cupboards. I shouldn’t actually call them cupboards though since they were actually more like built-ins. Just one of the many “fun” things you learn about your house when you start construction. They were not easy to tear out. Alex persevered though and torn them out piece by piece. May 9: Â Everything is out and it looks so small emptied out. 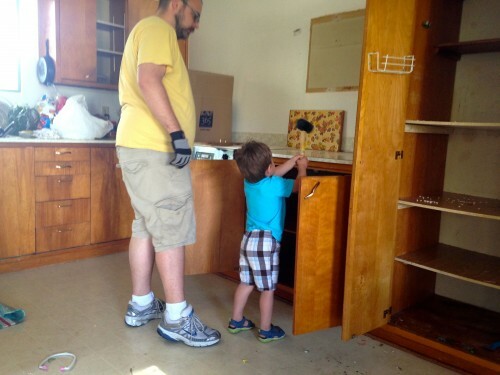 My brother came down today and he and Alex picked up the cabinets and got to work. 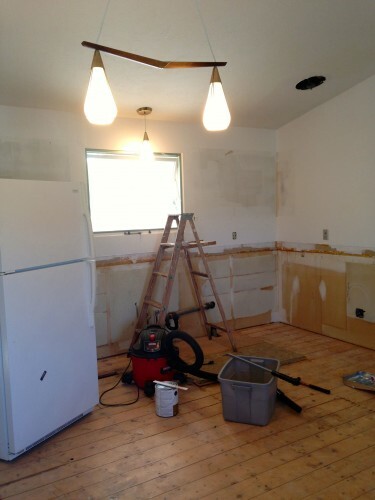 May 10: My dad and father-in-law come down to help lay down the new wood floor. By the end of the night my wall cabinets were all in and the fridge was set in place. 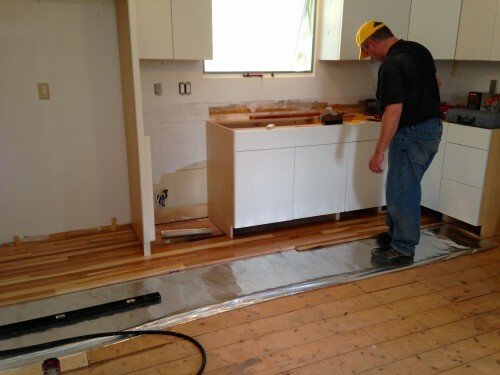 The new kitchen floor was laid. 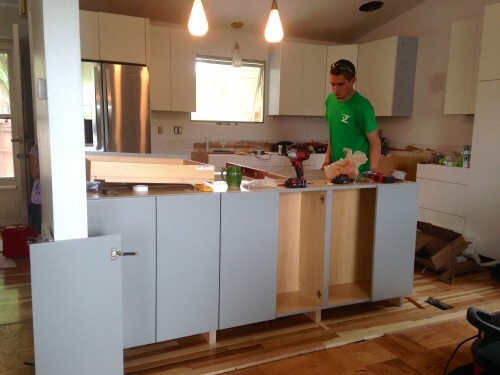 May 11: My brother and Alex set the cabinets for my peninsula. This is probably one of my favorite parts of my new kitchen. 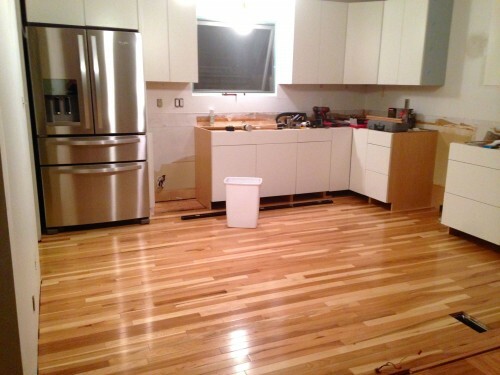 By the end of the night I had a room that looked very much like a kitchen (sans countertops & sink). 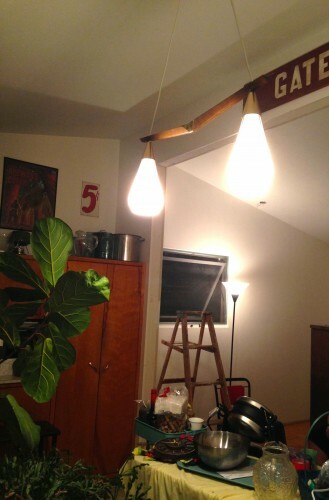 We had the hardest time finding new lights that would fit the style of our home. In the end we decided to keep the original 1962 fixtures and just spray the gold silver. I think they work. Remember, I was due with baby #4 during this remodel. Chaos, I know. This is what my dining room/living room looked like for most of the month of May. Our countertops came in the following week and we were able to put it back together 11 days before Felix was born. Thank goodness! Now are you ready to see it all finished?! Alex got some fun Hue lights to add to the tops of the cabinets and under the peninsula. I love it! After cooking and entertaining it in for two months now I can say that I absolutely love it. Thanks to the hard work from my brother, husband, and our dads I was able to have a functioning kitchen after two weekends of hard work. The lady at Home Depot told me it would take four months of construction to have a new kitchen (if we used their team) well I laugh in her face ha-ha. I am thankful I have a super skilled, hardworking brother to lead our remodeling team. We opted to put our microwave in our peninsula. I am so glad we did. 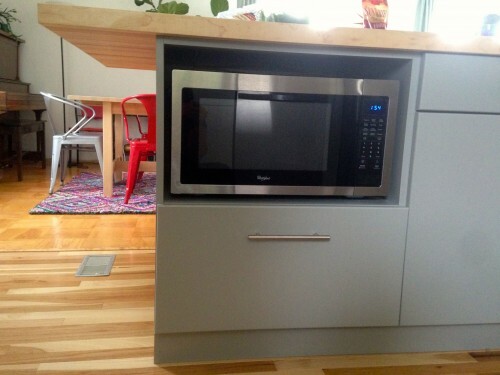 It is so great to not have a giant ugly microwave taking up counter space or in my line of site. 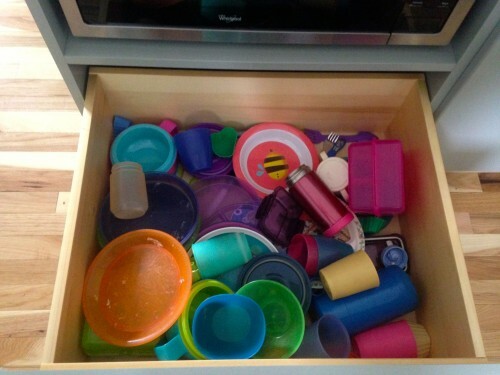 The giant drawer under the microwave has all the plastic kiddie dinner ware and lunch box stuff. Which is perfect because Kasper can easily unload his stuff from the dishwasher. 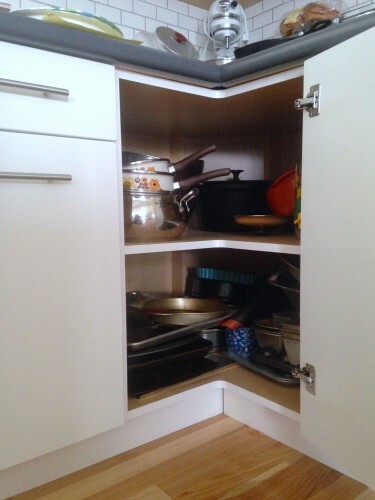 We also opted to skip the lazy-susan in our corner cabinet. 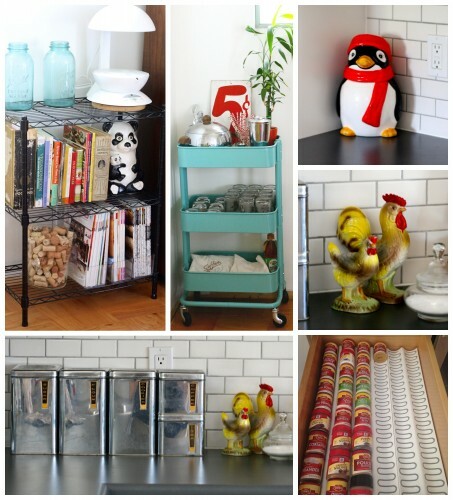 This is perfect for me because I can stack up my pans and organize them how I use them. 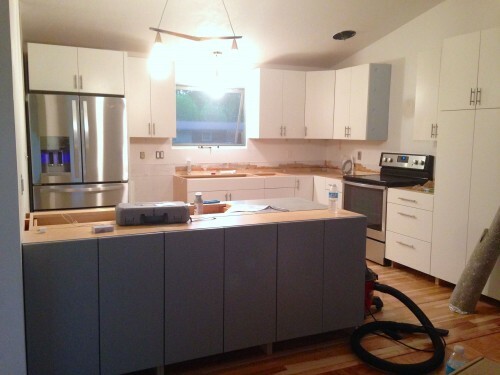 Another favorite is my decision to put cabinets on both sides of the peninsula. 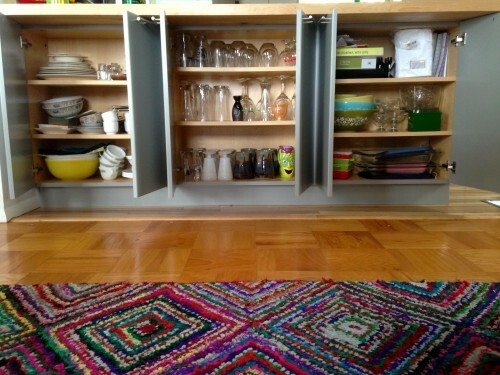 The dining room side cabinets are shallow, only 12″, but they are perfect to store so much stuff. No more running downstairs to grab extra glasses or plates when I have a dinner party. 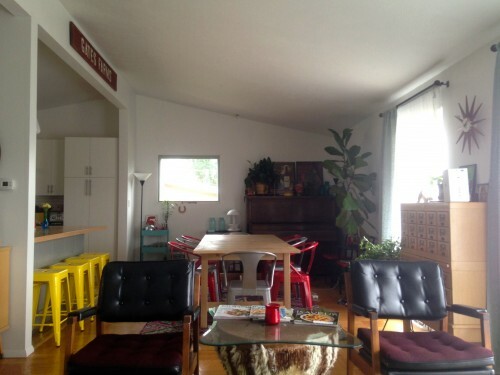 Two more bonus shots off my very open living/dining/kitchen area. View from the living room. View from dining room. 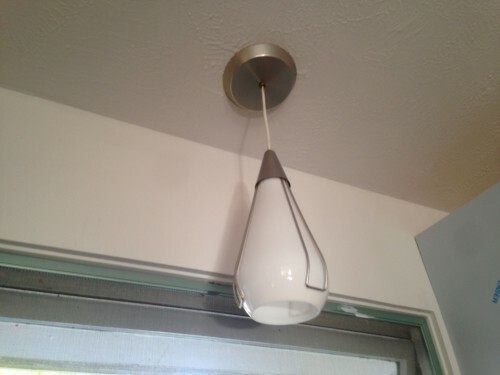 We are still on the hunt for a dining room light. Do you have a suggestion? And lastly a few fun things that make me happy to when I see them. I hope you have enjoyed taking a look at my new kitchen. If you have any questions leave them below in the comments and I will do my best to answer! Pour syrup in the bottom of a glass and top with your favorite beer. Cheers! Oh my gosh I am in LOVE!! First of all, can I move in please? And secondly, is it weird that I have been dying for this post?? Thank you for all the pictures and details and that list at the end. 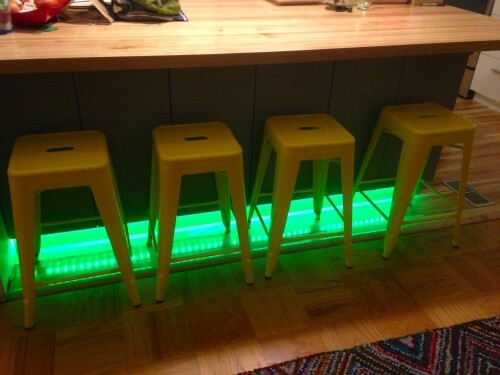 Love all your personal touches…those stools are so cool! My my, who am I kidding, I love it all. What an amazing difference. Can’t believe you kept your cool at 37 weeks. 🙂 I could have possibly lost my mind. The result is AMAZING!!! I *may* have felt overwhelmed at a few points but I knew I was in good hands. Beautiful kitchen! We were just discussing a remodel of our own, but we do not have quite the space that you do. Lovely! Thank you Heather. I love the transformation! The finished product looks amazing! 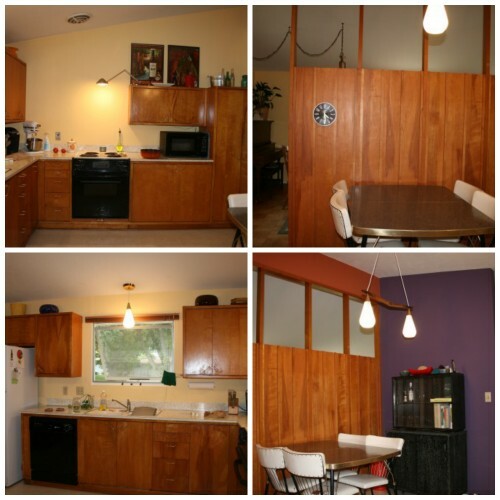 I’d love to remodel our kitchen, so seeing these before and after (and during) photos are good motivation to seriously give it consideration now. Thanks Kim! 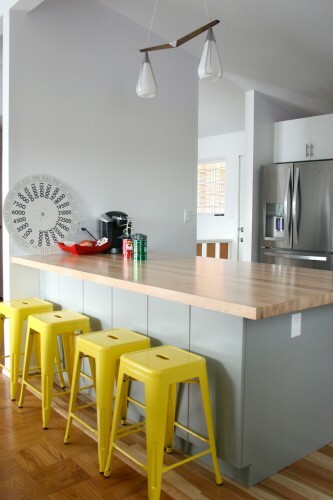 Remodeling is such an undertaking but the end result was so worth it! Wow, wow, wow. I have a kitchen as old as yours was. I don’t even know where to start. You have some great helpers and some great ideas! Beautiful result! Thank you Lisa! 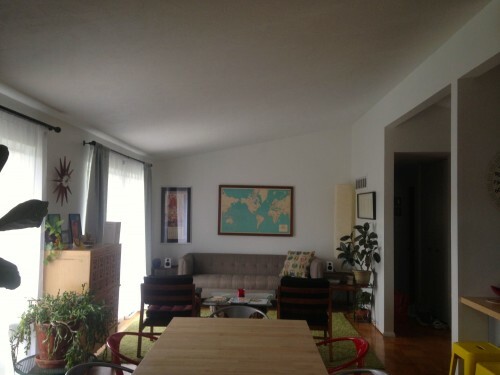 I desperately wanted an update but also wanted to stay within the “feel” of the early 60s house we have. 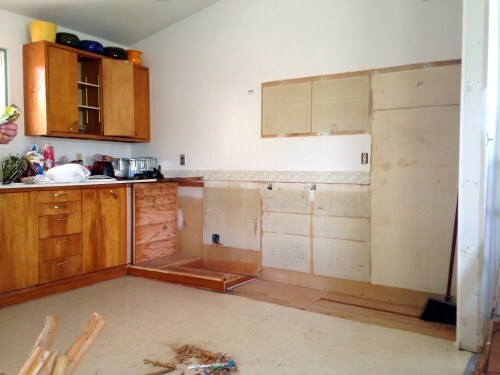 We have been storing cabinets for our kitchen remodel for five years. If I knew just 2 weekends would be involved, I bet they would be in by now :-). You have quite the crew! My brother is quite the worker. So glad he led the crew. 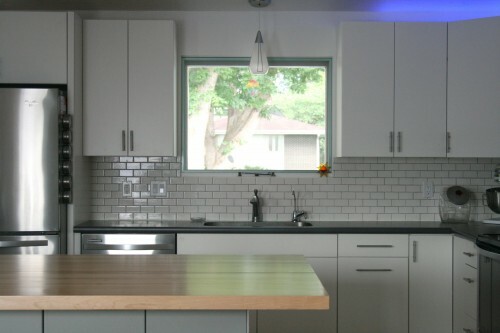 Omg your kitchen is like night and day! I LOVE it!! Thanks Erin. I have probably said “I love this kitchen” two dozen times in the last two months. I love it so much. I LOVE your new kitchen! It looks so clean, fresh and organized. 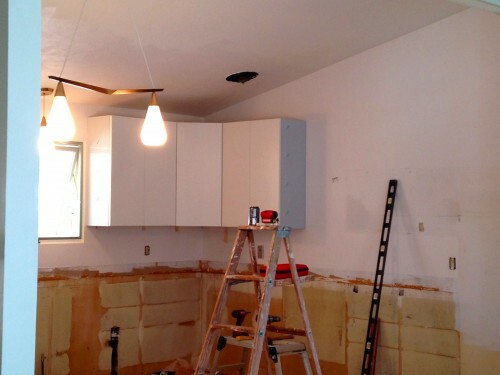 If I am ever in need of renovating I am going to call you up! WOW! This is better than an HGTV remodel show. Impressive! This is GORGEOUS!! I love the modern, sleek look and the personal touches. I think that it’s so cool that the whole family pitched in. Thanks Vaneese! I don’t think I will ever want to move away from my kitchen. It is exactly as I want it. OMG how the heck did I miss this? I was following this fixup with excitement! 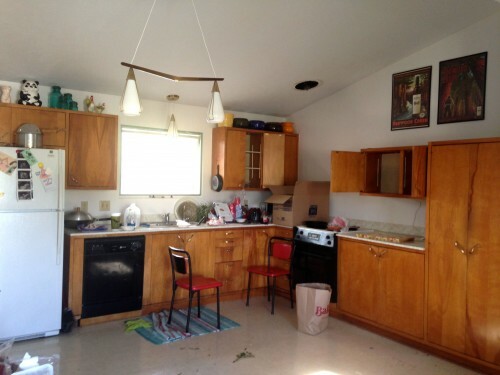 Your kitchen looks AWESOME. 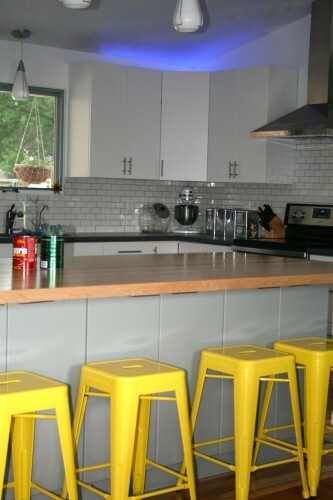 I’m so jealous, I love everything, especially the floors.. and the backsplash.. and your AWESOME RAVE LIGHTS! LOVE!